Got a project you'd like to have CNC cut? Don't want to call? Request a quote from us via email. If you have any drawings, even a sketch, send that along. We are happy to work from your CAD drawing, or we can draw it for you from your sketches or descriptions. For a successful cut, we need a vector drawing in AutoCAD file format, DWG or DXF, with all curves drawn as polylines rather than splines. But don't worry, if you can't produce that, or aren't sure what it all means, we have a lot of tricks available to convert your drawing to this format. We do definitely need a vector drawing, from a program like Adobe Illustrator or Corel Draw, rather than a raster image such as a JPG or PNG. We'll be able to convert almost any vector format you have, such as AI, EPS, or SVG. PDF files can have both vector and raster images in them, so some will work and some won't. Due to limitations of the CNC machine code, please be sure that any curves are polyline curves, created from arc segments, rather than spline or Bezier curves. We may be able to convert splines, but we cannot guarantee the same level of accuracy on drawings we convert. If you aren't sure your file is scaled to the correct size of your part, include dimension information so we can verify the size. A labeled line or square in the same scale as your parts is sufficient for dimensioning. For parts with blind holes, pockets, dadoes, or other features that don't go all the way through the material, indicate the depth to cut to. If you're working with a 3D model, we can accept certain 3D file types as well. But if what you need cut is flat, most 3D programs will allow you to export a drawing on an arbitrary plane. AutoCAD's DXF format is very commonly used for this kind of export and it's ideal for us. For full 3D drawings, we can work with IGES, OBJ, and 3DM file types, although 2d files are preferred. STLs and other mesh surfaces are not well suited to export of 2d cutting information. Unfortunately we cannot open Solidworks files; please export your Solidworks models to one of the above interchange formats. If all you have is a photograph, send that anyway. We will at least get a sense of what you need and be able to ask intelligent questions. Our draftsperson can work with you to create CAD drawings, at our standard hourly rate. 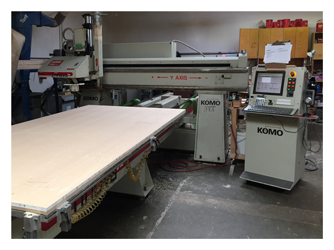 We have a KOMO Innova 510 3-axis router with a powerful 12 HP spindle motor. The bed is 10' long and 5' wide. Raw materials wider than 5' won't fit on the machine. Material longer than 10', such as plank lumber, will fit, but we can't cut any parts longer than 10' from them. Multiple smaller parts are fine. Our Z axis goes up to 6" from the bed of the table, giving a 3" limit on through cuts (the bit has to be 3" long, and it has to be able to travel entirely above the material). We can sometimes stretch this a little, get in touch to discuss your specifics and we'll see if we can figure out a way.